Note: Roselite Group is not listed in our database for this locality. This specimen may be misidentified or the mindat list of rocks and minerals at this locality may be incomplete. 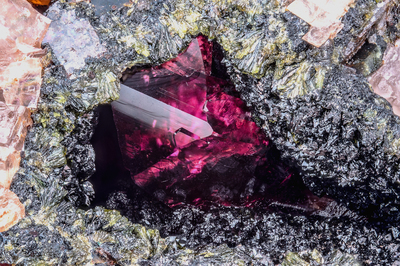 In a vug of radiated crystals, of cobaltaustinite, olive green, dark, a crystal of a mineral belonging to roselite group, magenta, intense.